Faisal Malick, a former devout Muslim who once tried to convert Christians to Islam, had a sudden encounter with the living God and came to a revelation of Jesus Christ. 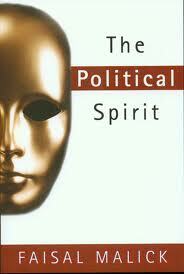 His book is titled, "The Political Spirit." As a result, hundreds of people came to know Jesus through his passionate lifestyle of evangelism. Today, he is the founder and president of Covenant of Life Ministries, a multi-faceted training organization that equips the church, ministers to leaders and brings timely prophetic revelation regarding the purposes of God. He is a visionary leader, dynamic conference speaker, TV personality, and best-selling author. His compelling books include Here Comes Ishmael, Destiny of Islam, and Positioned to Bless. He and his wife Sabina are known as hosts of the popular television program “The Plumbline.” They have a strategic media mandate to the Muslim world and are a unique voice in our times.